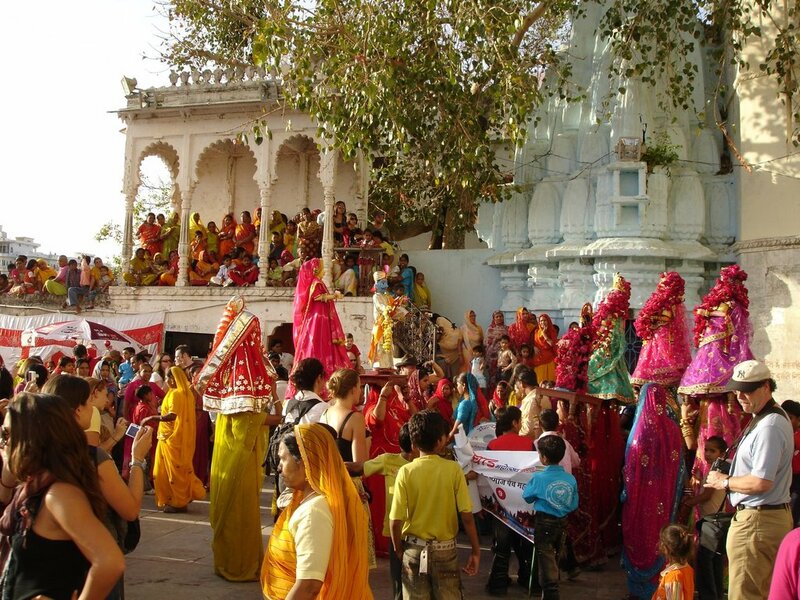 Historic monuments, shopping destinations, spiritual temples, street food of Delhi, etc a lot will surprise you. If you want to experience Delhi in a luxurious way then luxury trains are the options here. 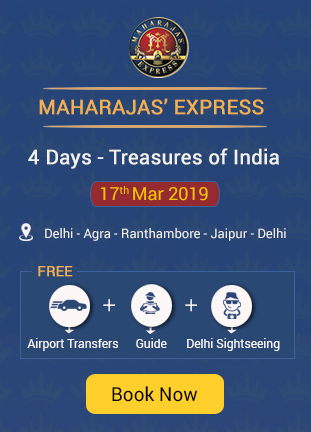 Book with Maharaja Express Train and feel like royals. Here it is given the top 15 Places to Visit in Delhi that you shouldn’t miss. Red Fort is like India’s pride and honor. 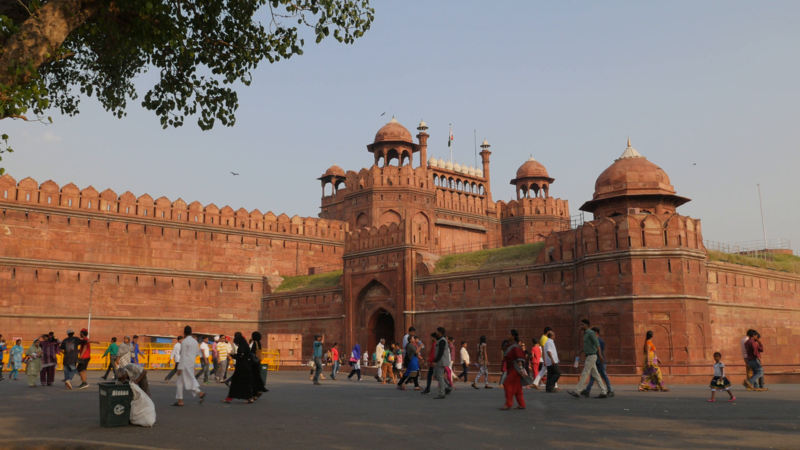 The red sandstone magnificent construction by Mughal dynasty is a great tourist attraction in Delhi. Nearly for 200 years, this fort was under the rule of Mughal dynasty and it made this fort to be known all over the world about its great architectural styles and attractions. You can witness many museums inside the forts, great red sandstone fortifications, several complexes, etc a lot. Every day at evening Red Fort Light and Sound Show will be organized for one hour in both Hindi and English languages. Timings for the show are from 6:00 pm and charges are 80Rs/- for adults and 30Rs/- for Children. Visiting: Opens from 9:30 am to 4:30 pm every day except on Mondays. Location: Netaji Subhash Marg, Lal Qila, Chandni Chowk, Delhi. How to reach: Nearest airport, Railway Station, and Bus Station to Red Fort are Lal Indira Gandhi International Airport, Old Delhi Railway Station and Kashmiri Gate Bus Station. 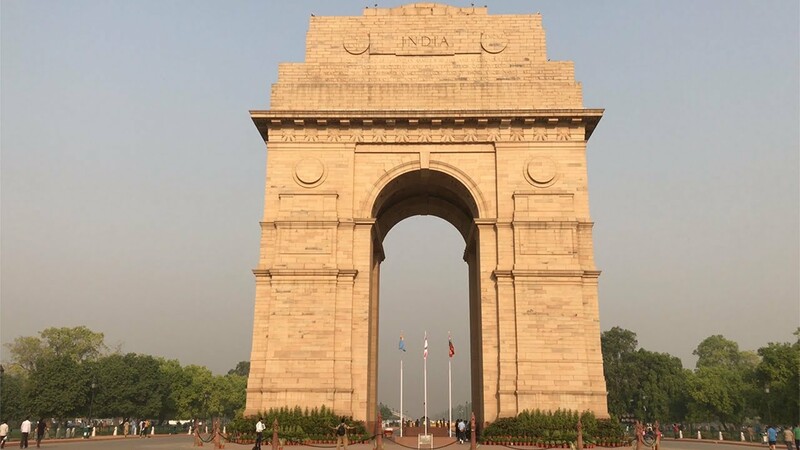 India Gate is a marvelous architectural structure, commemorated to soldiers who died in the First World War and Anglo-Afghan War. If you observe on the gate you can see 13300 names of soldiers and officers of United Kingdom. India Gate is a beautiful picnic point in Delhi surrounded by gardens. Moreover, evening it looks amazing with the glittering of lights. Such a tranquil place in Delhi. Visiting: Always open from morning to evening. Location: Rajpath Marg, India Gate, Delhi. How to Reach: Closest metro station to India Gate is Central Secretariat (Yellow line). from there you can hire an auto-rickshaw or taxi. India’s second highest minaret with 73mts high and declared as UNESCO Heritage Site. This minaret was built by Qutub-ud-din Aibak and it is five stored brick minaret. 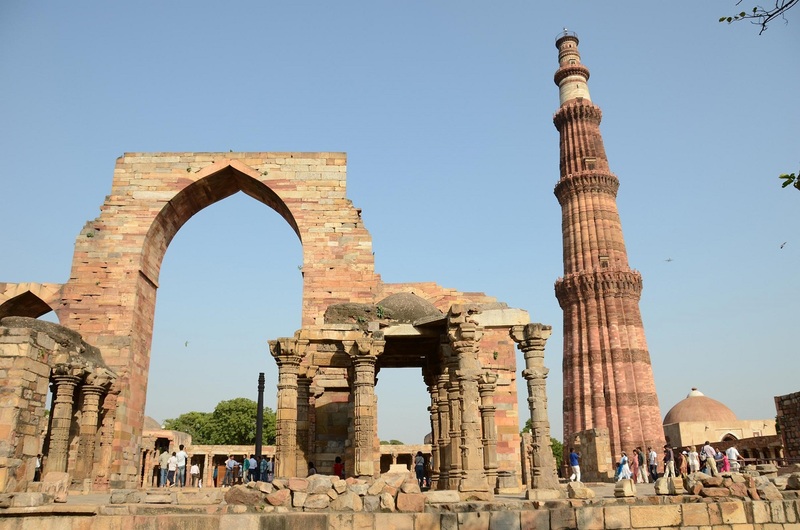 The top three stores of Qutub Minar with marble work looks beautiful and awesome. At the foot of the monument, there is a mosque which is India’s the first mosque. The standing tall minaret in the middle of historic remnants looks great and attention seeking. Visiting: From Sunrise to Sunset but closed on Mondays. Entry Fee: No Fee for children below 15 years, 30Rs/- for Indians, 500Rs/- for Foreigners. Location: Mehrauli in South West district, Delhi. How to Reach: Nearest metro station to reach Qutub Minar is Qutub Minar Metro Station and nearby Delhi airport within 30 to 40 minutes you can reach Qutub Minar. Lotus Temple is a famous tourist spot in Delhi where you can see unity in diversity. This temple is open for all to come and pray for their religious god. 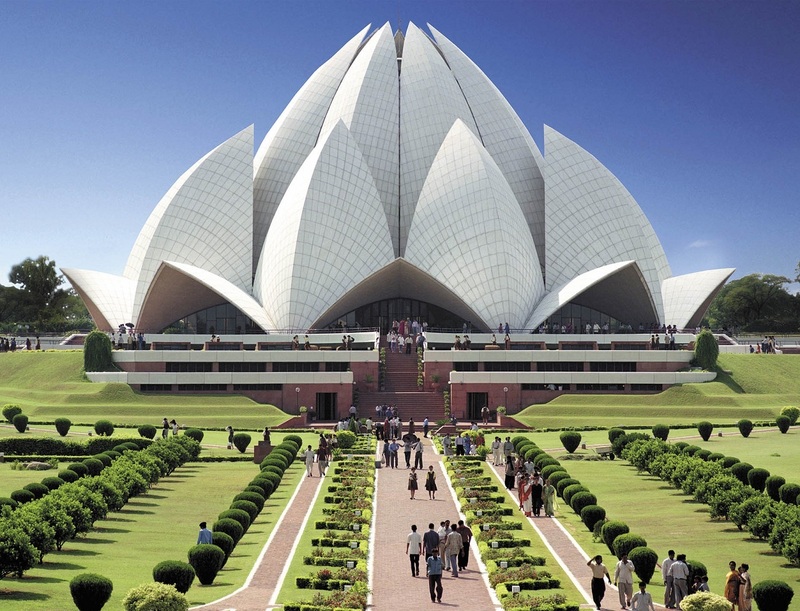 Lotus temple follows the concept of Bahai means open for all religious. The architectural style of the temple in Lotus shape is the major attraction that’s why today it is world widely popular. Gardens and pools around the temple maintain a pleasant atmosphere to meditate and enjoy the pleasantness. Visiting: During Summers from 9 am to 7 pm and in Winters from 9 am to 5:30 pm. Opens every day except on Mondays. Location: Lotus Temple Rd, Shambhu Dayal Bagh, Bahapur, Near Kalkaji, New Delhi. How to Reach: The nearest metro station is Kalkaji metro station (Violet Line) from there you can access to Lotus Temple. 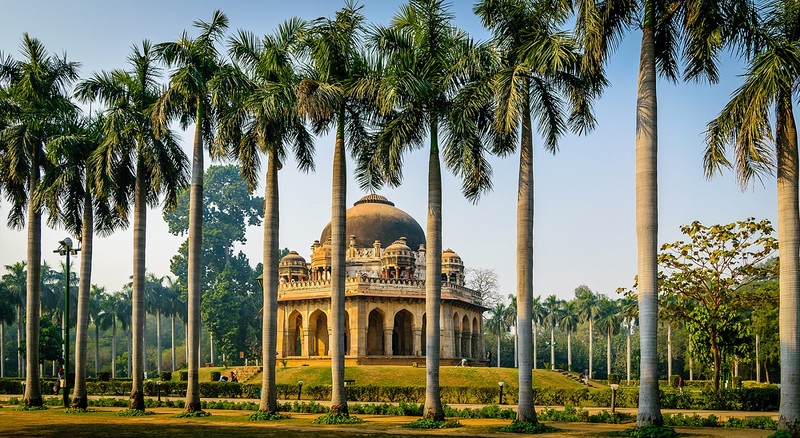 Lodhi Gardens in Delhi is a defined place for family picnics and to spend leisure time with friends. 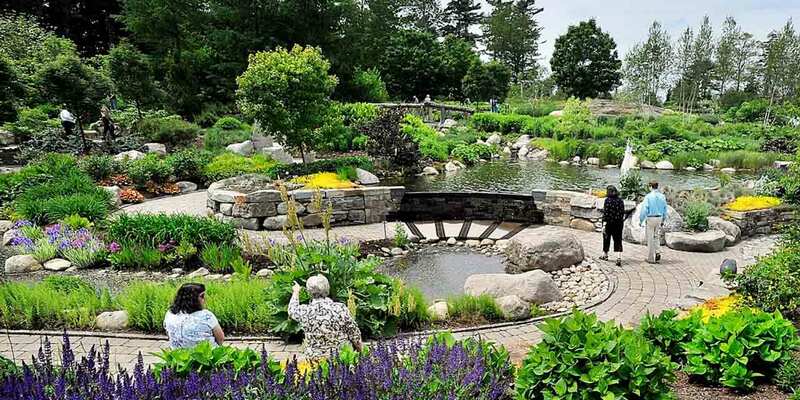 A beautiful garden spread over 90 acres of land with full of greenery, bushes, flower plants etc. You can witness here some historic monuments of the 15th century and they are Mohammed Shah’s Tomb, Sheesh Gumbad, Sikander Lodi’s Tomb, and Bara Gumbad. These historic monuments are known for beautiful architectural works. Historically and for good environment, Lodhi Gardens is the best place to visit. Visiting: Opens from 6 am to 7:30 pm on all days. Location: Main Lodi Rd, Beside India International Center, New Delhi. How to Reach: The nearest metro station is Jor Bagh metro station (Yellow Line) and from there you can pick a taxi to reach Lodhi Gardens. Swaminarayan Akshardham Temple complex known for its unique architectural styles. 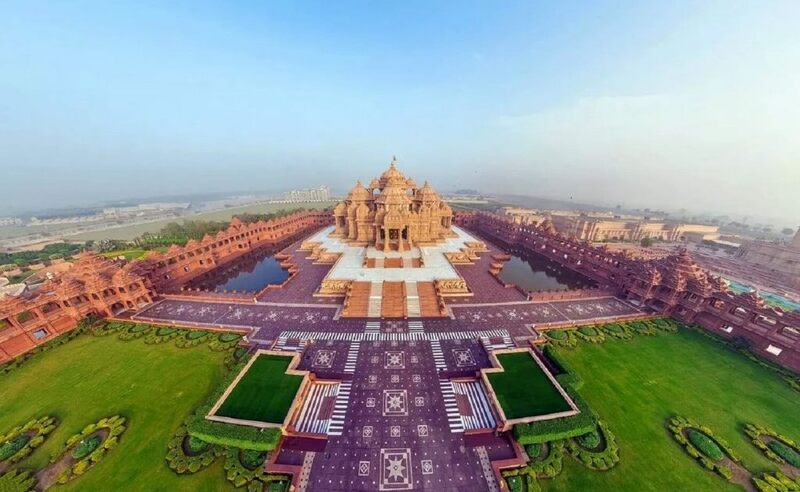 And Akshardham temple is one of the largest Hindu temples in the world also. The temple is the most visited place in Delhi with a large number of visitors daily. The architectural significance with pink and white marble stones, pools, gardens, fountains etc attracts everyone heart. 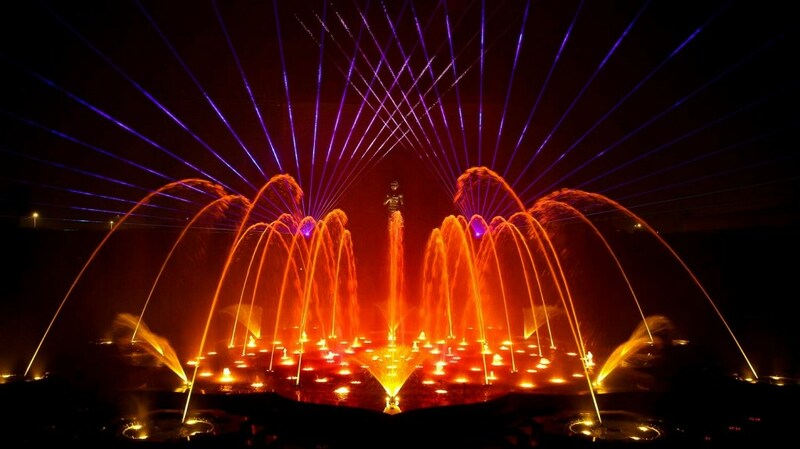 Musical Fountain exhibition is the major attraction of the temple. Akshardham Temple is the must-visit place in Delhi. Visiting: Closed on Mondays, every day from 9:30 am to 6:30 pm. Entry Fee: No Entry fee but to view exhibitions we have to pay. Location: NH 24, Akshardham Setu, New Delhi. How to Reach: The closest metro station is Akshardham metro station (Blue Line) and from there five minutes by auto you can reach Akshardham temple. Garden of Five Senses is a romantic and joyful place in Delhi to visit and enjoy a lot with its memorizing attractions. The garden was spread over 20 acres of land full of trees, shrubs, herb gardens, bamboo courts, and pools etc lot varied attractions. In this garden, there are 25 beautiful sculptures which look beautiful and awe-struck. The presence and tranquil atmosphere of the garden rejuvenate your five senses that’s why this garden named as Garden of Five Senses. Visiting: During Summers from 9 am to 7 pm on all days and in Winters from 9 am to 6 pm. Entry Fee: For adults 35Rs/- and 15Rs/- for children up to 12 years and senior citizen. 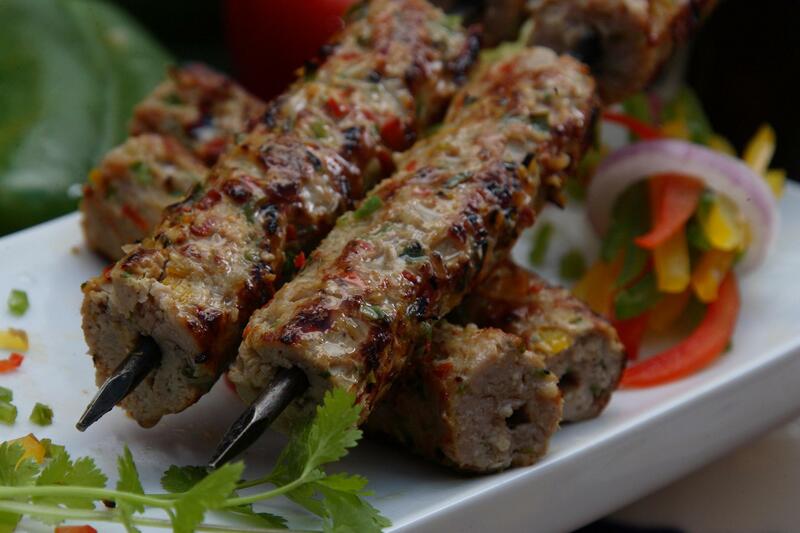 Location: Near Saket Metro station, Mehrauli-Badarpur Rd, Said-ul-Ajaib, South of Saket, New Delhi. How to Reach: The nearest metro station is Saket, from there you can take auto-rickshaw or by walk, you can reach the place. Indira Gandhi Memorial Museum is the former house of Indira Gandhi who is one of India’s Prime Minister. The complete building was turned into white and the surroundings of the house are covered with trees, flowers, gardens, etc. It seems very calm and pleasant. 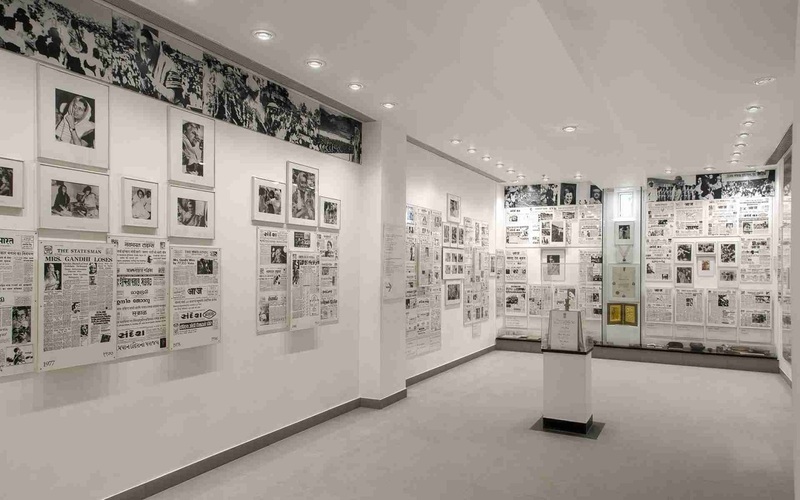 This Memorial Museum exhibits the belongings of Mrs. Indira Gandhi. In this museum, the total life history of Indira Gandhi can be seen and also you can experience past India politics also. Visiting: From 9 am to 5 pm on all days except Mondays. Location: Safdarjung Rd, New Delhi. How to Reach: The nearest metro station is INA metro station (Yellow Line) to reach Indira Gandhi Memorial Museum. A significant place to experience Indian Railways processing. 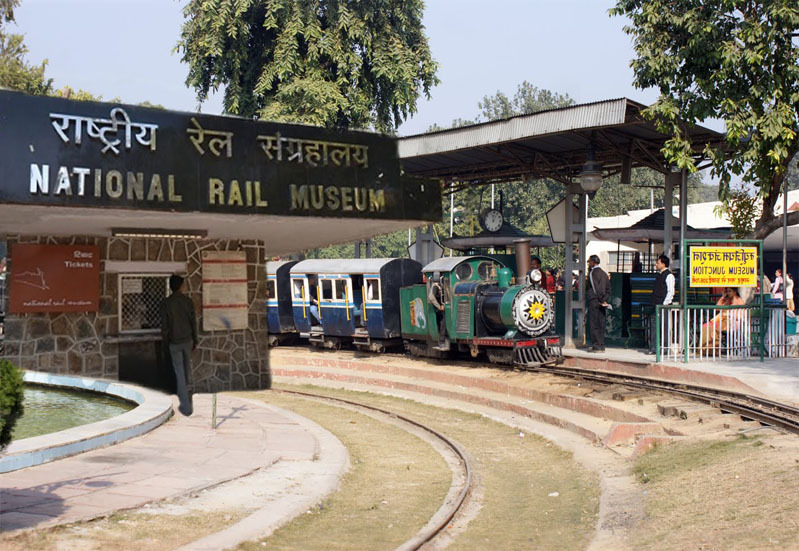 National Rail Museum exhibits various train collections from olden days which were used by Indian Royal Kings and Queens. Here you can see static and working models, antique furniture, Prince of Wale’s Saloon, Maharaja of Mysore’s Saloon, and different types of simulators etc. These are also the major attractions of the Museum. Moreover, here you can go for a joy ride. Visiting: From 9:30 am to 5:30 pm. The museum will be closed on Mondays and National Holidays. Entry Fee: 50Rs/- for Adults and 10Rs/- for Children (3-12 years). Location: Market Rd, Block F, Chanakyapuri, New Delhi. How to Reach: The nearby metro station is Dhaula Kuan Metro station, from there the Museum is 2kms far away. 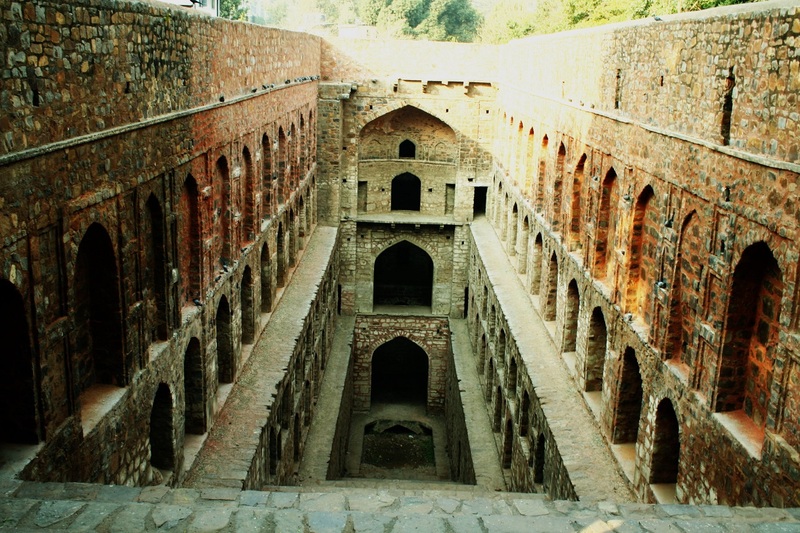 Agrasen Ki Baoli is a coolest and also haunted place in Delhi. Actually, it is step-well to preserve water in ancient times but it looks very beautiful with its architectural attractive carvings. Agrasen Ki Baoli is 60mt long and 15mt wide step well and surrounded with the buildings of Connaught Place. Interestingly, at night times this place is known for haunted activities. But in the morning it is so pleasant, even some writers choose this place to pen their writings. Visiting: Opens on all days from 7:30 am to 6 pm. Location: Hailey Rd, Near KG Marg, Connaught Place, New Delhi. How to Reach: The nearby metro station is Rajiv Chowk (Yellow Line). 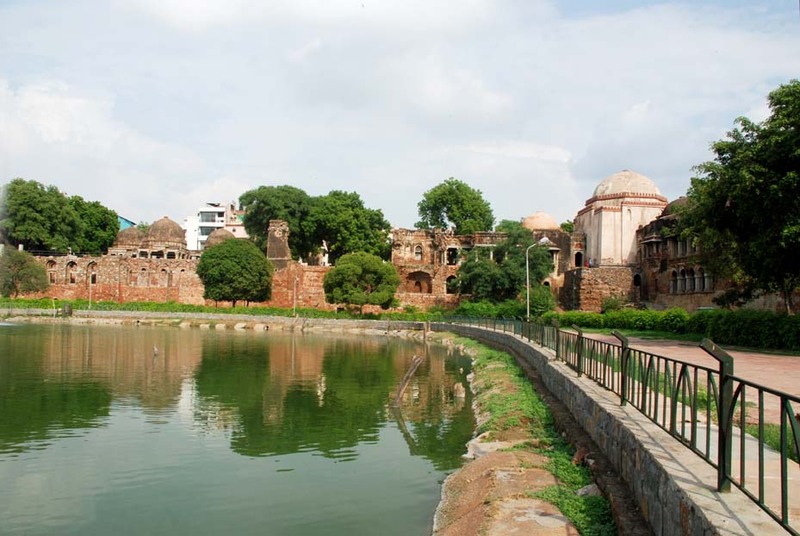 Hauz Khas Fort is a spectacular fort amid of beautiful lake with scenic attractions and beauty. 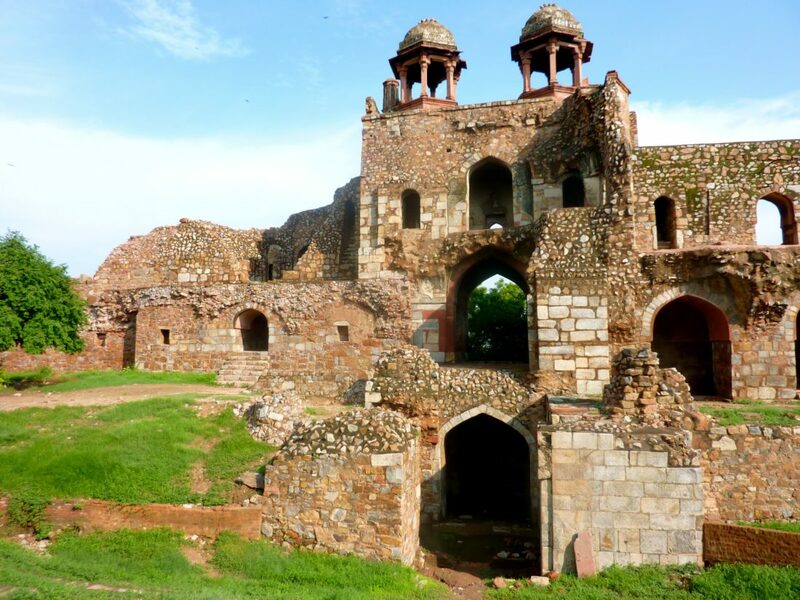 Firoz Shah Tughlaq is the person who made the fort beautiful place with recreational spots. This fort is rushed with enthusiastic birdwatchers and nature lovers. While moving to the fort through Deer Park is so lovable and interesting to watch some animals. 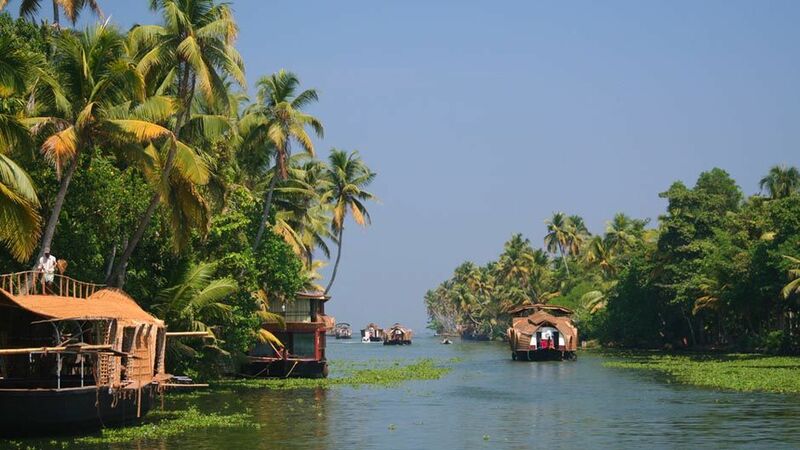 Apart from the Fort, the village is known for dive bars, clubs, restaurants, and shopping destinations. Visiting: From Sunrise to Sunset every day. Location: Hauz Khas village, South Delhi, Delhi. How to Reach: The closest metro station is Green Park (Yellow Line) from there you can reach the Hauz Khas village. India’s official President house is known as Rashtrapati Bhawan and the complex houses many rooms for the staff, residence of bodyguards etc. It looks in the red aura with stunning architectural styles and this mansion is known for its gardens known as Mughal Gardens. In Delhi, visiting Rashtrapati Bhawan will be memorable by witnessing the residence of Indian President. 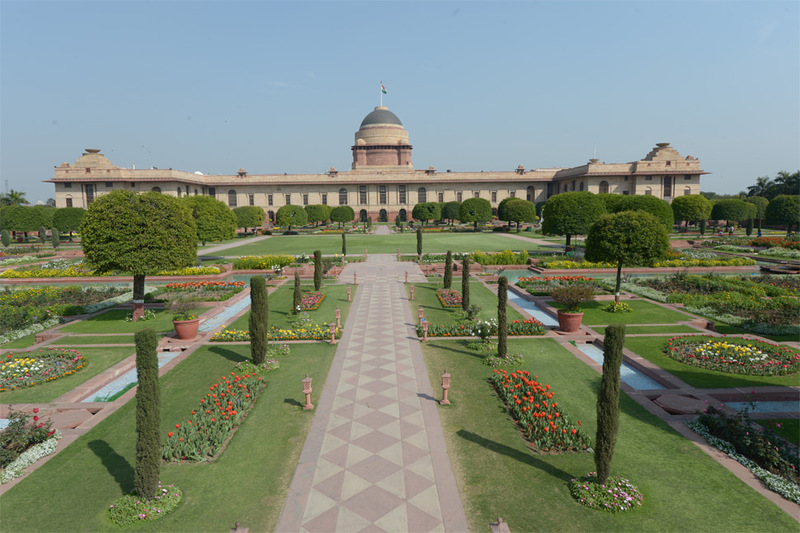 The major attraction of the Rashtrapati Bhawan is its gardens. Visiting: From 9 am to 4 pm but the gardens are open from August to March on Friday, Saturday, and Sunday. Entry Fee: 50Rs/- per head and 1200Rs/- for a group of 30 persons. Visiting Rashtrapati Bhawan will be allowed in groups. So per one group also amount is quoted. If a group is more than 30 persons then the charge is 1200+50 additional visitor. Location: Rashtrapati Bhawan, President’s Estate, New Delhi. How to Reach: The closest metro station is Central Secretariat (Yellow Line). 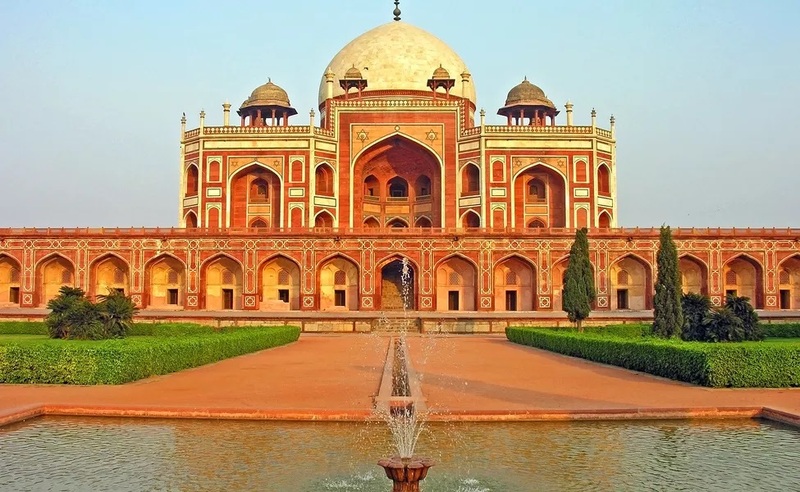 Humayun’s Tomb is a UNESCO Heritage Site in Delhi built by Mughal rulers. It is the mausoleum of the great Humayun Mughal Emperor and it was built by his wife Haji Begum. In India, it is the first Tomb with a garden. The tomb lies in the center of the garden with connecting water shallows looks very impressive and attractive. Even Taj Mahal was constructed by taking it as the reference. So many Mughal rulers were also buried in this garden Tomb. In one word, an important place to expertise Mughal architecture. Visiting: Opens on all days from 8 am to 6 pm. Entry Fee: 35Rs/- for Indians, SAARC, and BIMSTEC visitors. 550Rs/- for Foreigners. Location: Opposite Dargah Nizarmuddin, Mathura Rd, New Delhi. How to Reach: Khan Market metro station is the near point to reach Humayun’s Tomb. Purana Qila is the oldest fort in Delhi and it was built by Sheh Shah Suri. It is also a must-visit fort to experience the remnants of the old fort. There are many attractions around the fort to see and enjoy a lot. Nearby lake boating is allowed so you can go for a boat ride. every day at evening light and sound show will be conducted. These are the major attractions of the Fort. Don’t forget to visit National Zoological Park, where you can see hippos and hyaenas. You are permitted to hire a vehicle also so you can happily take a ride throughout the Park. Visiting: From 7 am to 5 pm on all days. Entry Fee: 20Rs/- for Indians and 200Rs/- for Foreigners. Location: Mathura Rd, Near Delhi Zoo, New Delhi. How to Reach: Nearby Metro station is Pragati Maidan metro station (Blue Line). From there you can pick a taxi to Purana Qila. 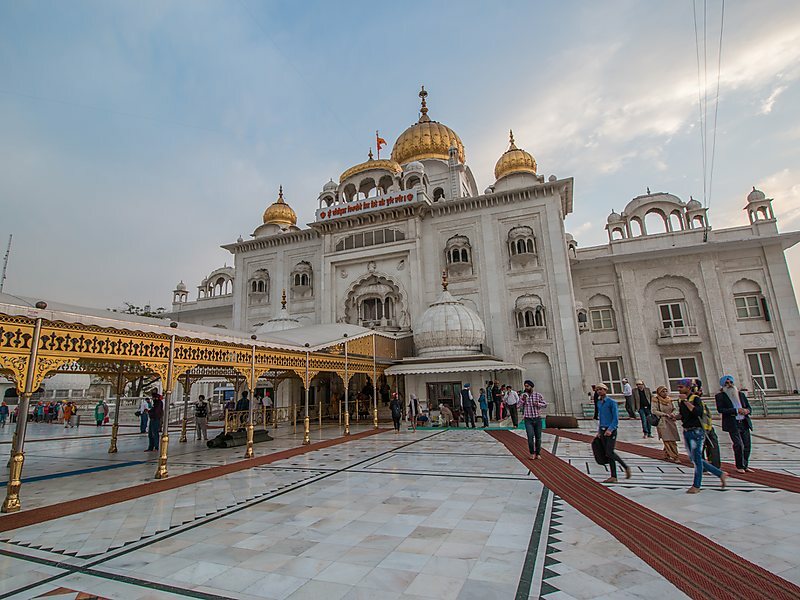 A very sacred place for Sikhs in Delhi is Bangla Sahib Gurudwara. There is a pool inside the temple complex is known as Sarovar which is very sacred to Sikhs. The main importance of this temple is its kitchen. To this temple, everyone is allowed and for all them the kitchen of Gurudwara Bangla Sahib provided food. And this whole temple complex houses a higher secondary school, a library, hospital, and Baba Baghel Singh Museum. This sacred Sikh temple in Delhi is the most visited place. Visiting: Opens all days 24 hours. Location: Ashoka Rd, Hanuman Rd Area, Connaught Place, New Delhi. How to Reach: The nearest metro station is Patel Chowk (Yellow Line) from there you can reach the point. Delhi is the capital city of India and the hub of IT, Finance and Administration. This city has everything to explore from monuments to fort, foods to shopping etc. Reaching Delhi is easy as it is connecting several International and Domestic Flights, Roads and Trains. Delhi has its own Indira Gandhi International Airport and well connected to the cities across India and the world. You can find regular flights from Delhi to Bangalore, Mumbai, Lucknow, Chennai, Goa and the International destinations. Delhi is the starting point of the world renowned Luxury Trains like Maharaja Express. This train has 5 Luxurious journey which offers 3 Nights 4 Days and 7 Nights 8 Days Journey to several major destinations. By Road – Delhi City is well connected by bus to city of Jaipur, Chandigarh, Agra, Amritsar, Manali, Dehradun, Kathmandu and Others. There are several bus stands in Delhi which is the Interstate Bus Terminals located at Anand Vihar, Kashmiri Gate, Sarai Kale Khan. By Car – Delhi is well connected by several highways and you can travel by car to your desired destinations. You can enjoy Jaipur, Agra, Dehradun, Chandigarh, Alwar, Amritsar and others by car.